QI Macros is a technically reliable and very cost effective solution for our college; and very intuitive to use. The performance of this Excel add-in compares very well to other software that costs much more. Select the Data or the Chart? You: Analyze your data and select a chart. Point to data to define range. Most users have data BUT don't know which chart to use. QI Macros is a fantastic tool. It allows me to do things that once took 30-60 minutes down to 2-3 minutes. It's also very user-friendly and easy to operate. 1. In Excel, select the chart you want. 2. Click on QI Macros Menu and select the desired chart or the Control Chart Wizard if you are not sure. 2. 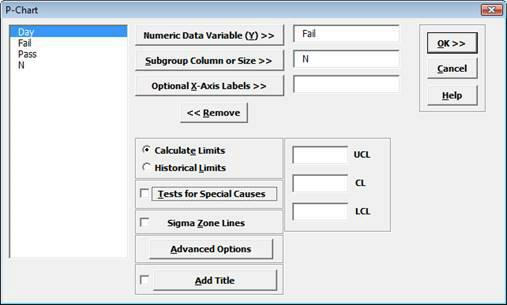 In the Sigma XL window, define the data range in your spreadsheet. 3. QI Macros will do the math and draw the chart for you. Better yet, if you don't know which chart to use for your data, QI Macros control chart wizard can analyze your data and select the right chart for you. 3. Here is where SigmaXL gets ugly. You have to define up to seven different items like numerator, denominator, data labels, chart title, etc. In comparison, the QI Macros contain code to determine most of this for you. 4. QI Macros gives you more time to focus on the chart and what it tells you. 4. 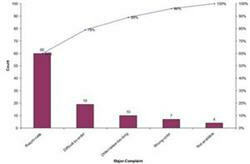 SigmaXL will do the math and draw the chart for you. As you can see, there is a complicated additional step to achieve the same result. And, as we know from Lean, extra steps mean additional chance for error and more importantly: delay. Most people find step 3 confusing. How do I select my data? What column do I select to do what? Does it really need to be this hard? Bars over 20% of the total are shaded. Bars have no space between them. Second and Third Quartiles are distinguished using colors. No special shading of bars. Bars have space between them which looks like a bar chart. Cumulative line doesn't extend through the chart as it should. Second and Third Quartiles within the box are the same color. Because QI Macros has you select your data first, it can help you analyze it and run the right chart or test. Sigma XL and other competitors CANNOT do this since they make you select the chart first. I was very well impressed with the functionality of QI Macros Data Mining Wizard. This certainly saves time and cuts down the chart populating process substantially. I will be recommending this tool to my colleagues here at work and within the ASQ leadership community. Just drop your data sets into the data input sheet and click on the "Create Charts" macro button to create a control chart dashboard for all of your measures. QI Macros contain more than 40 chart templates including all attribute and variable control charts, pareto, scatter, box whisker charts, histograms and more. Just drop your data into the yellow input area and your charts are built in the same spreadsheet. Every two weeks I have to update 600 control charts for more than 30 hospitals in our system. I used to spend three days updating these charts. Once we created the charts using QI Macros Control Chart Dashboards, and utilized automation including stability analysis, we reduced the time it takes to update the charts to just three hours. QI Macros Control Chart Dashboards save me valuable time that I can use for other important projects. Thanks for making this process quicker and easier. No matter the criteria - QI Macros come out on top. Purchase QI Macros SPC Software for Excel through our secure shopping cart or try a free, QI Macros 30-day trial!